Gaining popularity due to its simple clean lines and refined aesthetic, Scandinavian style is here to stay. Bring a sophisticated sense of style to your bedroom with an elegant and modern Scandinavian bedside table. Discover a wide selection of Scandinavian bedside table styles below, which offer ample amounts of storage and space. Style it with the rest of your bedroom furniture set, with a range of matching storage sets to choose from and keep your room looking on trend and clutter free! The perfect bedside companion, a Scandinavian bedside table is a necessary finishing touch for any bedroom. Keep all that you need close at hand, with drawer and cupboard space to hold items and a surface offering the perfect place to sit a lamp. 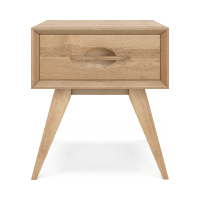 Built to the highest standards of quality, Brosa's range of Scandinavian bedside tables have been made using premium materials, by an expert team of makers. The range includes pieces with clean contemporary design, made from materials such as polished wood and metal, with refined designer accents. Discover a wider range of storage pieces from Brosa, and create style cohesion around your home!